A friend and I enjoyed a bit of clearance shopping last week. As she gleaned one rack, I gleaned another. 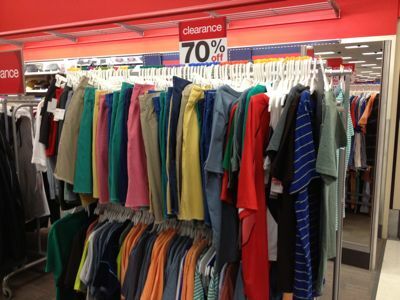 It was while scooting hangers left to right that a sweater fell to the floor. I bent over to pick it up and my sunglasses fell from their perch on my head. Quick as a wink, though, a nearby shopper (not my friend) retrieved them. With a big smile for me, she returned to her shopping. Sauntered with two or three others down the middle of the parking lot lane, oblivious to the fact they’re holding up traffic. Common courtesy seems to be disappearing from society, as some people have allowed the constant pursuit of self-interests to turn into self-absorption. Perhaps they think worrying about other people’s feelings is a waste of time and energy. Others may see customs of politeness as downright archaic and puritanical. The truth is, courtesy and consideration can do us a world of good. Research indicates that kind deeds release feel-good endorphins into our nervous systems. Benefits include diminished pain, decreased depression, and relieved stress. (1). 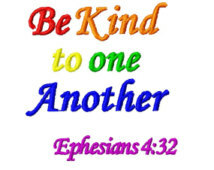 Of course, the Bible has taught the value of kindness all along (2). Yet some folks cringe at the thought of teaching scriptural principles to our children in school or holding ourselves to those standards. “Legalistic!” they claim. Cheerfully greeted one another, even if we’re strangers? Allowed others to enter a building or aisle first? Held doors for one another? Treated service personnel (clerks, wait staff, attendants, etc.) with friendly respect? Said “thank you” at every opportunity? 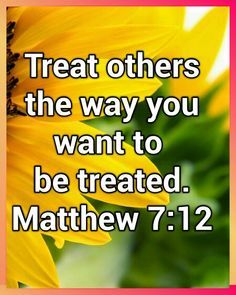 Followed the Golden Rule that Jesus taught (Matthew 7:12)? Good manners are based on good principles; good principles are found throughout the Bible. Oh, Lord, help me leave footprints of kindness wherever I go, to live out your Golden Rule for the benefit of others and for the praise of your glory. May others know I’m a Christian by the cross I wear and the love I share. (1) Allan Luks, The Healing Power of Doing Good (2001). (2) Examples include: Galatians 5:22-23, Ephesians 4:32, and 1 Peter 2:17. This is such a simple and easy way to live out scripture. I try to be kind and cheerful. The days I am successful are much better than the days I am not. Thank you for this reminder. Love and blessings, Ginny. You ARE a kind and cheerful person, Ginny! That’s one of the reasons I’ve always enjoyed your company all these years. Love and blessings back to you, dear friend. Thank you, Nancy, for this very important and much needed message. You have beautifully written what you exemplify in everyday living. My prayer is that it will be read by enough people that it will really resonate and make a difference in our society. Love you. Thank you for your KIND words! Love to you also, Ruth. Oh yes and amen, thank you for writing about this. Little acts of kindness can change someone’s day, or outlook, or even a mindset. I also think they add up, over time, create a small testament, perhaps the equivalent of a paper trail, though visible only in memory. Perhaps another piece of creating slow change is that moment when someone opens a door for us (or hands us what we’ve dropped) and we meet their eyes and thank them with our most winning smile. Especially if it’s a boy or young man that opens a door for us. Let’s reward the behavior. Here’s to kindly civilities that ease life and help create a gentle society! You make an insightful observation about kind deeds adding up over time. I’m thinking of folks we all run into frequently (like the waitress at a favorite restaurant) who consistently sees us as kind, cheerful, interested in her, generous to her, etc. Such consistency demonstrates the love of Jesus and often provides opportunity to share about him more specifically. Thank you, Laurie, for the reminder! Thank you Nancy! A very good awareness reminder in acts of kindness. And thank YOU, Janet, for being such a faithful reader and encourager! Thanks, Nancy. Good post. I try to exhibit these kind acts as well. You are so right; today’s world has seen a decrease in good manners and courtesy. The one thing I do need to work on, though, is my response to telemarketer phone calls! Instead of just hanging up on them I should exhibit kindness. That must be such a depressing job! They call me fairly early while I’m still sleeping and since I don’t have caller ID in my bedroom…I answer. Thanks for the great suggestions! I like the one asking them to move on to the next call. The trick is to sound cheerful…which I can definitely do! Sometimes it is very difficult to get a word in…in which case a gentle hang-up is called for! Loved this one and it is nice to open a door and someone actually says, Thank you. Most of the time and in every state people have been friendly. I try to be and 99% of the time if someone is having a bad day they might not respond but they still need kindness. That is something that is not my first reaction… to be kind when someone is outwardly rude. You’re right, Sam. Those who are rude probably need kindness the most. God, give me grace to respond to rude people in loving, respectful ways that draw attention to You! Your welcome, Bill. They’re always well-deserved! 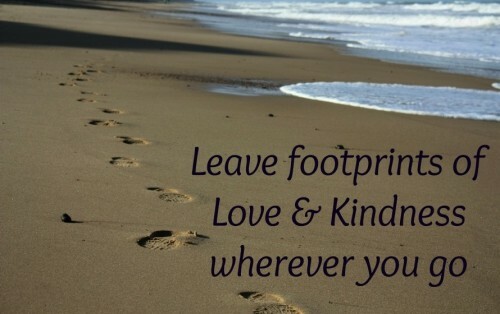 You DO leave footprints of love and kindness wherever you go, Lisa–at home, at work, at church, with your friends (!)–everywhere. You are such a blessing to all who know you!